No photos tagged with Red Lion Truckstop. If you have one, why not upload it? Single site located at the side of the road. 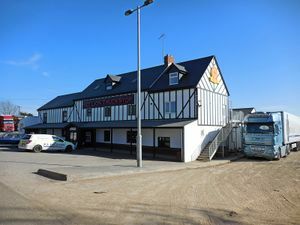 The Red Lion Truckstop is a large pub with lorry parking signposted from the A4500, positioned close to M1 J16. It is an old inn positioned on what used to be the main A45, but this was bypassed by a new dual carriageway and renumbered. Access is available in both directions. Secured and organised parking is available for a fee. Parking tickets are purchased in the bar and shop. Further information is not available, please update this if you know.